(Nanowerk News) Like vast international trading companies, biological systems pick up freight items (in the form of small molecules), transport them from place to place and release them at their proper destination. These ubiquitous processes are critical for activities ranging from photosynthesis to neuronal signaling. The efficient capture, transport and release of molecules is also vital for the maintenance of equilibrium (or homeostasis), essential to all living things. In research appearing in the current issue of the journal Nature Chemistry ("An aptamer-functionalized chemomechanically modulated biomolecule catch-and-release system"), Ximin He, Ph.D., and her colleagues* describe a method capable of mimicking Nature's ability to sort, capture, transport and release molecules. The technique sets the stage for continuous and efficient manipulation of a broad range of molecules of relevance to human and environmental health. Much of He's research, the current project included, centers around the design of energy-efficient, environmentally-responsive materials and devices capable of reacting to environmental cues, adapting their behaviors and exhibiting self-regulation. Such biomimetic analogues show remarkable potential for applications ranging from biological/chemical sensing and separation to energy harvesting and conversion. "Biological systems use feedback as a crucial component to provide efficient performance. Yet, the use of feedback has not been exploited to a sufficient extent in the design of new material systems," He says. "We must learn how to engineer responsiveness to environmental changes and the ability to perform important functions into the framework of new materials. In this research, the components are integrated to enable adaptive functionality and encompass feedback." The highly interdisciplinary research integrates chemistry, materials science, and mechanical engineering, in addition to biology. It has broad implications in diverse fields ranging from biotechnology and biomedicine to chemical engineering and environmental remediation. Continuous self-monitoring and self-regulation are hallmarks of living systems, which seamlessly convert chemical to mechanical energy and vice versa, subtly adjusting their state as environmental conditions change. For these purposes, macromolecular components capable of converting chemical events into mechanical motion or vice versa are needed. Transformations of chemical and mechanical energy are essential for organismic self-regulation and survival and are responsible for such phenomena as ATP synthesis and muscle contraction. Researchers would like to create synthetic materials that can emulate this behavior, but the task has been challenging. Typically, synthetic materials operate in only one direction, either transforming chemical to mechanical energy or the reverse, and tend to be responsive to a limited chemical repertoire. In contrast, the method described in the new study offers great versatility, permitting the capture, transport and release of specific target molecules from complex mixed solutions. The approach described could be applied for sustained-release drug delivery systems, new generations of ultra-sensitive diagnostics and chemical sensing devices. In addition to applications in biomedicine, the technique's ability to extract a range of components from chemically complex solutions could one day be applied as an energy-efficient means of removing waste from the environment, capturing valuable minerals, performing desalinization of sea water or trawling for hazardous substances like radioactive nuclides or heavy metals in rivers and streams. The method is rapid and suitable for numerous biological and biomedical applications that require separation of sub-microliter samples for downstream analysis. Unlike most existing methods, the new technique can operate autonomously, mimicking the self-regulatory nature of living systems, through interconnected feedback loops. This property allows the system to operate with high efficiency and reliability without the need for external energy sources like laser, infrared, magnetic or electric fields used in conventional materials and devices. At the heart of the new system is a substance known as a hydrogel, a highly absorbent polymer that can mimic certain properties of living tissue. Indeed, hydrogels are sometimes applied as scaffolds for cell cultures used to repair damaged tissue. Some hydrogels also display a delicately tunable sensitivity to their environment. These hydrogels--sometimes referred to as 'Smart Gels'--can sense subtle changes in their surroundings, including alterations of temperature, pH or metabolite concentration. In response, the hydrogel may expand or contract, and in the process, cause the binding or release specified target molecules, under proper conditions, (see Figure 1). In the current study, researchers designed a chemomechanical system using aptamers capable of detecting the human enzyme, thrombin. (Aptamers are DNA, RNA or peptide molecules sensitive to specific chemical targets). 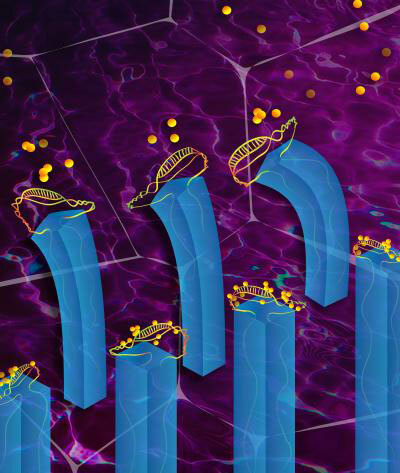 Binding aptamers for thrombin were used to decorate microscopic fins embedded in a pH-responsive hydrogel. Changes in pH and resulting expansion or contraction of the hydrogel moves the thrombin-sensitive aptamers--which are also pH-sensitive--between the two chemically distinct environments. Under low pH, the aptamers denature, losing their affinity for thrombin, further assisting in thrombin release coinciding with hydrogel contraction. The system showed efficient and reversible sorting, binding, transport and release of thrombin under sensitive pH control. With pH adjusted to a range of 6-7, binding occurs, followed by molecule release when pH falls below 5. The authors liken the process to kinesins and dyneins--naturally occurring motor proteins that walk along cellular highways known as microtubules, carrying along varied molecular cargo for distribution inside the cell. The new technique offers a significant advance over conventional methods of sorting biomolecules, which typically involve molecular modification, numerous experimental steps and energy input from external sources. Further, the new system is highly adaptive to different situations, permitting fine-grained control during continuous separation. The reversible nature of the capture, transport and release system allows for multiple recycling of biomolecules and high rates of target recovery. The use of complementary responsive materials permits the system to be custom designed to meet a broad range of needs.